Three versions are available: 1100GTO, 1100GTO-AE and 1100GTO-AEL. The latter two versions include the Standard Temperature Absolute Encoders or the Extended Temperature Absolute Encoders, respectively. If you order the 1100GTO without the absolute encoders, you will be able to purchase them at a later date to install yourself. AP's optional Right-Angle Polar Alignment Scope will allow you to quickly zero in on the pole or the polar alignment routine in PEMPro (included) will guide you through the process. You can even align the mount during the day with our clever Daytime Polar Alignment Routine (outlined in the Keypad Manual) for solar observing, viewing the planets at twilight, or just getting a jump start on a long night. AP's motor/gearboxes were designed to be responsive for precision astro-photography, while at the same time making it super easy to use and adjust. Using modern CNC machining techniques, AP makes all components to a high precision level, which results in a final package that is solid and accurate in all respects. The critical angles are accurately machined so that the mount is orthogonal to a very high degree. This results in pointing accuracies well below 1 arc minute for a properly aligned mount. Massive thrust bearings and preloaded shaft bearings provide excellent stability under all imaging situations. The design of the 1100GTO is straightforward with modular construction. AP provides information in the Technical Support section of their website pertaining to typical adjustment issues. The heart of this mount is a precision gearbox using custom high-quality fine-pitch gears, coupled to a highly accurate worm and worm wheel. These parts are manufactured and assembled at AP's facility and individually tested to meet or exceed their periodic error specification of 7 arc seconds (+/- 3.5 arc sec.) before introducing any periodic error correction. The PE is smoothly variant with extremely low ripple or moment to moment error. In contrast, mounts that use commercial gearboxes have very small spur gears with tiny teeth and too few of them. This generally causes ripples in the tracking rate which are difficult to guide out. 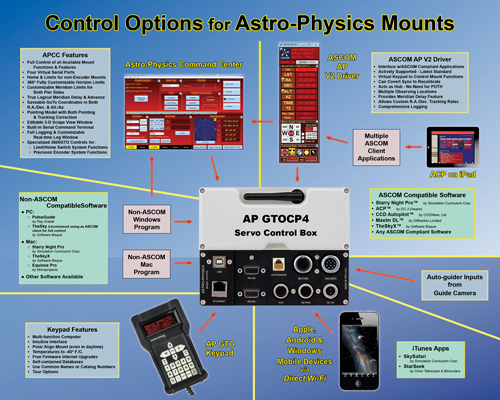 Each mount is rigorously tested on AP's specialized periodic error tester. Only mounts that provide an accuracy of 7 arc seconds or better will pass this inspection. If the mount exhibits greater error, the substandard part is identified, replaced and the mount is retested. PEMPro (Periodic Error Management Professional), Version 3, by Sirius Imaging is included with this mount. It is a very powerful Windows software application that allows you to correct your mount's periodic error, polar alignment and backlash using your CCD Camera or Webcam to dramatically improve tracking and guiding. As mentioned previously, AP's extensive testing procedures include several PEMPro runs so that your new mount will perform with optimum PE correction out of the box. Simply use the Keypad, the ASCOM driver or APCC software to turn PE Correction "on." Although you will not need to use PEMPro when you receive your mount, you may wish to do a PEMPro run at a later date after the worm gear has run in. Depending on usage, re-measuring error and re-loading periodic error correction from one to four times a year is a good practice, especially if you do some unguided images from time to time. PEMPro also includes a powerful polar alignment routine. Absolute Encoders allow the mount to know its exact location regardless of accidental software errors and will allow its recovery. This is particularly important in remote setups. Furthermore, they virtually eliminate periodic error, reducing it below 0.2 arc seconds in AP's tests.